The purpose of this guide is to give members and visitors a quick overview of the cruising opportunities around Goolwa in South Australia. It is not meant to be an exaustive list of everywhere you can spend a night on your boat, but it covers the most common and safest anchorages. There are some other destinations described as well where they require local knowledge or are of interest to visit. For more comprehensive information please refer to the references listed below. These pages are always being added to and updated. If you have corrections, additions or just some good photos let me know. Every destination described in these pages can be reached within a day’s sailing of Goolwa in moderate (i.e. cruising) conditions. The Goolwa cruising area covers around 1400 sq km most of which is fresh water and comprises part of the River Murray. The area beyond the barrages is salt water and comprises the last few kilometres of the River Murray, its mouth and the Coorong ( a large salt, tidal lagoon about 100 km long). Some of the destinations are only a couple of hours from Goolwa, and some are a full day’s sail. Some involve a lockage through the Goolwa barrage and have a tidal component, and some require a traverse of ‘unprotected water’ as defined by state legislation and require the carrying of flares and PFD1’s. Most destinations have a marina, a jetty or a pole to tie up to. Some require nosing into the bank of a creek or a beach and some will need an anchor. Almost all are free, and some are limited to a 24hr stay. In a number of cases local knowledge will keep you out of trouble and you will find all you need to know in these pages. Some are in National Parks and some are private property with no access to the shore. Some have toilets and other signs of civilization and some have nothing but reeds, water and the stars. Readers are referred to the references below for comprehensive cruising information of not only destinations, but also safety issues and other aspects of a cruising nature. The author has been to all the destinations (except Shooting Creek where the approach is too shallow) in his yacht which draws about 900mm. 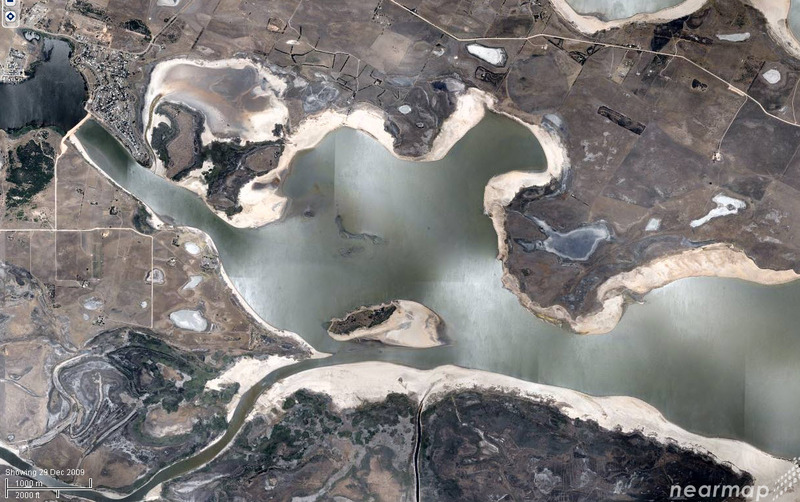 The waters of the Lower Lakes and Coorong are shallow in many places with often less than a 1000mm depth. Due to the turbidity of the river it is generally impossible to see the shallow water and local knowledge is needed. However all the main channels have channel markers and these often continue into larger bodies of water to indicate shallow areas. There are some cardinal markers, but they are usually already within marked shallow water. The following links are to documents that will indicate where a lot of the shallow water can be found. And here is a picture showing where all the shallow water is when entering out onto the lake. Most of the channel markers have been renumbered, new ones added and some more correctly located during the recent drought. This means that numbered channel markers mentioned in these pages are inconsistent with printed information (including the references quoted below). However common sense and a keen lookout will establish exactly which marker is being referred to when on the water. The following link lists the locations of all the channel markers in the Goolwa area. Access to the open sea through the River Murray mouth should not be attempted without expert local knowledge. There is almost always a big sea running and the breakers roll in faster than a sailing vessel can travel. All vessels on the River Murray need a ‘black-water’ containment system (a ‘porta-potie’ will do). The lakes are shallow and can change condition quickly and should be treated with respect. It is possible for boats to ground and be damaged between waves in adverse conditions. Due to the shallow water waves build up quickly with steep sides and a short fetch. If you are out on the lakes you will need flares and PFD1’s amongst other mandatory requirements. Please note you DO NOT need an EPIRB, although they will, of course, add to your safety. Always take a life jacket, sailing gloves, hat, sunblock, insect repellent and plenty of water. There is mobile phone coverage by the TELSTRA network more or less everywhere. The other networks may not cover all areas. VHF radio is the preferred method of radio communication and there is now a repeater network from Ceduna to Cairns. IN AN EMERGENCY DO NOT BE FRIGHTENED TO USE YOUR RADIO! In an emergency you may not be able to raise anyone on VHF channel 16, but there are repeater channels operating on VHF 80 and 83 which are monitored 24/7 and cover all the cruising grounds. There have been upgrades to the VHF repeater network in recent times and if you still cannot raise anyone return to channel 16 and specifically call 'Coast Radio Adelaide' with your emergency. The most comprehensive book is ‘Cruising from Goolwa’ 3rd edition by David Brook and is available from the Marina Hindmarsh Island. This book also includes a DVD of the area which is a nice addition to the book, but not a complete guide in itself. The 'Murray River Pilot Goolwa to S.A. Border' by R. & M. Baker and W. Reschke is also a useful reference including historical notes and hand drawn maps. The book ‘South Australia’s Waters an Atlas and Guide’ by the Boating Association of SA and the SA Government contains detailed maps and charts of all of SA coastal waters and all the River Murray including 34 pages of A4 maps of the Goolwa cruising region. This book is available from any good book shop for around $50. And don’t forget to use Google Maps to get good satellite pictures of the cruising grounds. The maps are not as good as the cruising atlas, but the pictures are excellent reference material, and often show where there is shallow water. In fact quite a few of the pictures were taken during the recent drought and show dry land giving convincing and crystal clear indication of where there is shallow water. The Bureau of Meteorology (www.bom.gov.au) provides boating advice up to four days ahead in the form of graphical maps of wind direction and strength spaced about 3 hours apart.